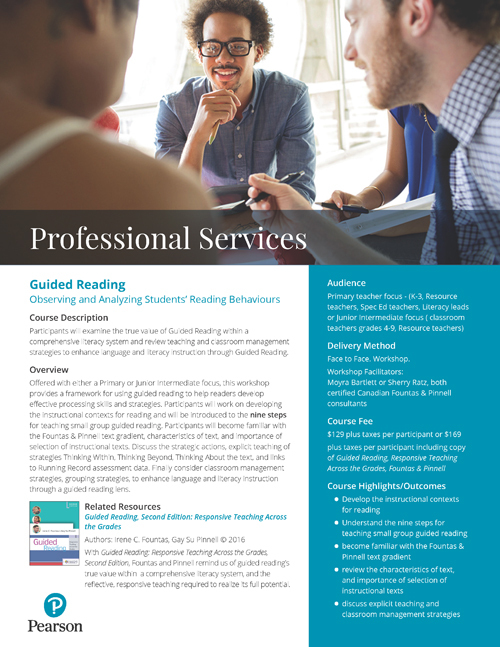 Participants will examine the true value of Guided Reading within a comprehensive literacy system and review teaching and classroom management strategies to enhance language and literacy instruction through Guided Reading. Offered with either a Primary or Junior Intermediate focus, this workshop provides a framework for using guided reading to help readers develop effective processing skills and strategies. Participants will work on developing the instructional contexts for reading and will be introduced to the nine steps for teaching small group guided reading. Participants will become familiar with the Fountas & Pinnell text gradient, characteristics of text, and importance of selection of instructional texts. Discuss the strategic actions, explicit teaching of strategies Thinking Within, Thinking Beyond, Thinking About the text, and links to Running Record assessment data. Finally consider classroom management strategies, grouping strategies, to enhance language and literacy instruction through a guided reading lens. 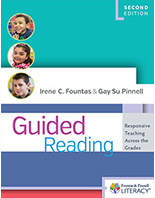 With Guided Reading: Responsive Teaching Across the Grades, Second Edition, Fountas and Pinnell remind us of guided reading’s true value within a comprehensive literacy system, and the reflective, responsive teaching required to realize its full potential.